Natalie Soroka is an economist in the Office of Trade and Industry Information within the International Trade Administration where she focuses on international trade statistics and trends. Five metro areas achieved more than $50 billion in 2012 exports and ten surpassed $25 billion. After hitting new highs in 2011, exports from U.S. metropolitan areas continued to increase in 2012, with 170 of the 370 metro areas with available data reporting record-high merchandise exports. Houston-Sugar Land-Baytown, TX topped the list as the largest metro exporter in 2012, shipping $110.3 billion of goods abroad. Overall, many areas saw continued growth in 2012, with exports increasing in 220 metro areas from the previous year. and Washington-Arlington-Alexandria, DC-VA-MD-WV (up $4.4 billion). While large areas like Houston, New York and Los Angeles contribute greatly to the value of exports from metropolitan areas sent around the world, exports are an important economic driver in smaller markets, too. In 2012, 153 small metro areas exported more than $1 billion of goods. Of these metros, exports from Bloomington, IN exceeded $1 billion for the first time in 2012. Viewing exports from the metropolitan perspective is important, as these are concentrated areas for industries and economic activity. In 2011, 22 metropolitan areas represented more than 40 percent of their state’s total merchandise export activity. One such area in 2012 was Miami-Fort Lauderdale-Pompano Beach, FL, whose $47.9 billion in exports accounted for 69 percent of Florida’s total goods exports that year. Aerospace products and parts accounted for the largest share of Miami’s exports, amounting to $4.8 billion in 2012. Other top export categories from Miami that year were computer and peripheral equipment ($4.1 billion) and communications equipment ($3.5 billion). Of the metro areas in Florida where data is available, 11 MSAs reported increased exports in 2012, led by increases in Miami, Lakeland, and Orlando. On the local level, areas often benefit from geographic proximity and economic or cultural ties to a particular country or region. In fact, Latin American partners dominate Miami’s exports. Miami exported $18.3 billion of goods to South American markets in 2012, led by Miami’s top market: Venezuela ($5.6 billion). Other top Miami markets in 2012 were Colombia ($2.8 billion), Brazil ($2.6 billion), Mexico ($2.1 billion), and Chile ($2.0 billion). Miami was also the top exporter to the Dominican Republic-Central America Free Trade Agreement (CAFTA-DR) region in 2012, exporting nearly $5.0 billion to this market in 2012, more than a quarter of which (27 percent) went to the Dominican Republic. Miami actually exported more to the six CAFTA members than it did to either the EU or our NAFTA partners. While it’s too early to determine any effect from the new free trade agreements with Colombia and Panama, in 2012 Miami was the second largest metro exporter to both of these regions, indicating that it stands to benefit from increased trade with these markets in the future. This data displays the importance exports are to not only our national economy, but to local economies throughout the country. Exports strengthen local economies and create millions of jobs. In 2012, exporters reached an all-time record of $2.2 trillion in U.S. exports, supporting 9.8 million jobs. The Department of Commerce has collaborated with the Brookings Institution Metropolitan Policy Program in order to create the Metropolitan Export Initiative. This initiative’s goal is to promote exports and investments in metropolitan regions through localized export plans. Beginning with the release of 2012 data, information on exports by county and 4-digit NAICS industry code are available for the top 50 U.S. metro areas. 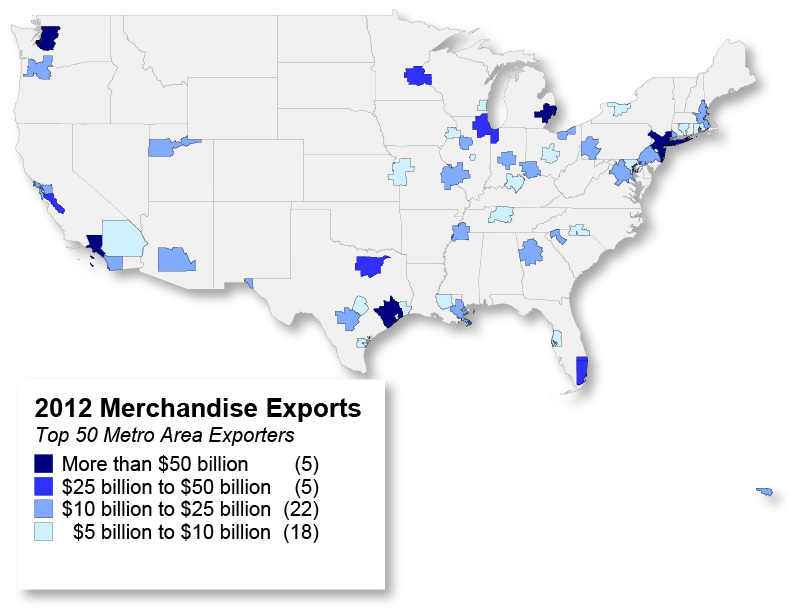 Visit ITA’s Metropolitan Export Series homepage for more information on metropolitan area exports, including data, fact sheets for the top 50 exporting MSAs in 2012, an overview of U.S. Metropolitan Area Exports, and the U.S. Trade Overview with new regional spotlights.